My best dear friend Christie is one of the nicest people I know. She is always there to help me whenever I need it. She is the first one there if someone needs help, a child picked up, a shoulder to lean on or just an ear to listen. She is also very selfless and is always thinking of everyone but herself. As a fellow mama I know how much she works with 2 little kids and one on the way. She never stops.She has a full heart but I know this mama needs some down time as well. That’s why it was a no brainer when it was time to pick out her Christmas gift this year.I knew a Groupon expeirence is what she needed. I know this sweet mama loves to get pampered but never does ,so my first stop was getting her a manicure and pedicure experience. That way I know she’ll go get her nails dolled up. Next, I know she loves eating at Tijuana Flats and I know she could live off of that stuff if she was allowed to.So I was excited to see a great Groupon deal from there as well and added that to her gift bag. Now here’s were I thought of the fun, her and her husband NEVER go out to dinner. I know many times it’s because it’s impossible to do so with 2 little kids so I decided to make it worth their while. I am offering up babysitting by me and a dinner voucher to one of their favorite Restaurants. I can only imagine how excited she will be when she gets her gift set. But the Groupon wasn’t the only gift. I made a little gift bag of her favorite chocolates, nailpolish colors and her favorite body splash. All things I know she will use! I can not wait to see her face when she opens up her gift bag filled with all these fantasitic gifts! This year do something a little different that your friends and family will really appreciate – give them experiences. This is the kind of gift that they’ll always remember! 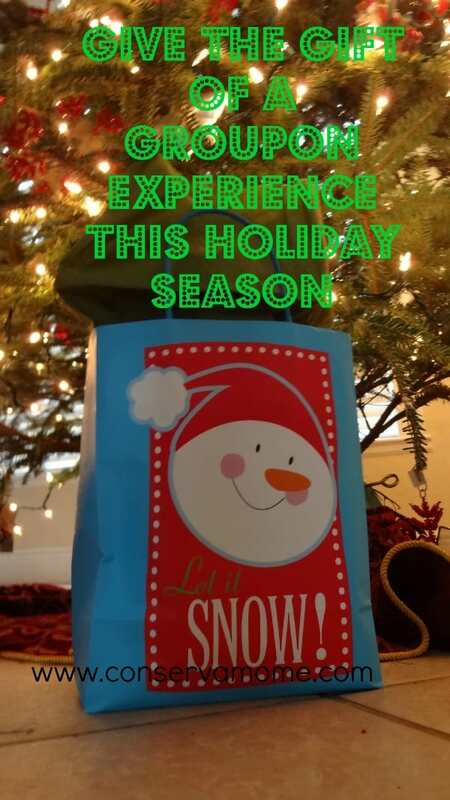 And to find an experience for each person on your list, Groupon.com is the perfect solution. Whether it’s a couples massages, skydiving, wine tasting, museum passes, or a weekend Getaway, Groupon has so many options for your spouse, your kids, your parents, your friends, and more. 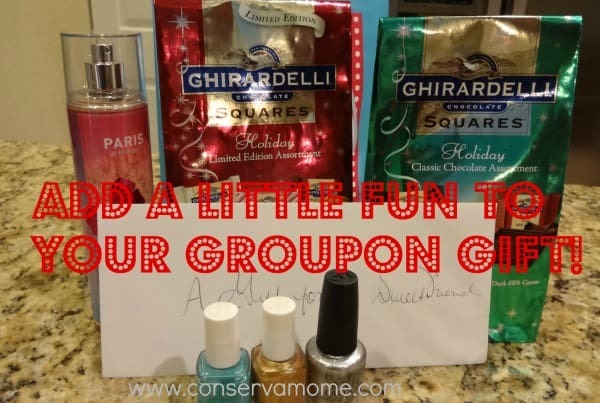 And don’t worry that giving an experience isn’t the same as handing someone a neatly wrapped box – come up with some really fun ways to give Groupons that are super easy for anyone to do. Groupon’s got more than just great gift ideas this season – they’ve also got special giveaways and discounts, so make sure to stop by. So give those special people on your list the perfect gift you know they will love. You don’t have to just give the voucher, add a little extra something like I did to make this gift even more special. Give them an experience they’ll never forget! I love groupon. I have used it many times for myself but never as a gift. Thanks for the reminder. I have found plenty on there that would be awesome as gifts but it didn’t dawn on me to use for the holidays! Guess I have my last minute gifts to give now! I love Groupon. We have bought many restaurant deals and two vacations on there. What a great idea thank you for the info. It will come in handy for the people I just don’t know what to get for them a this last moment! I have bought Groupon but had never thought about giving it as a gift. What a splendid idea. It sounds like you’re giving your friend a very thoughtful gift, it sounds great. I need to give Groupon some thought. Thank you for sharing this post. I will have to check this out, thank you for sharing with us. Groupon has some really great deals!! Giving a Groupon gift of an experience is such a great idea! Especially since a couple people on my list buy themselves whatever they want so it’s so hard to come up with a good gift for them! I love Groupon but never thought of using it for gift giving. Great idea! I’m going to have to go check out Groupon! I haven’t used them in several years! I have never heard of them before. Sometimes I think I must be under a rock or something. I do very little shopping on line. This does sound interesting, I’ll check it out. Thanks. Groupon makes sense for gift certificates. Such a great idea, you can get way more gift for your money with Groupon! I’ve never thought about giving Groupon as a gift–that’s a good idea! wow groupon is such an amazing website where i can get good deals and gift then to my loved ones.